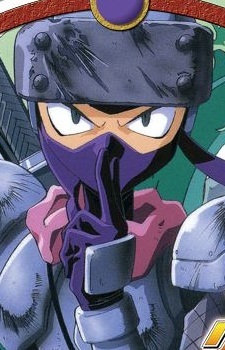 Sarutobi is a ninja and bounty hunter who starts out traveling with Princess Paffy and her priest in something like the capacity of a bodyguard and money maker for them. He possesses a Ryu Ninja called Bakurastumaru. (It is a dark navy color.) He is something of a hot-head and know-it-all. He is also an avenger, with the traits that entails. He has a running rivalry with Adeu throughout the series and often refers to him as the "Sonic Buffoon".